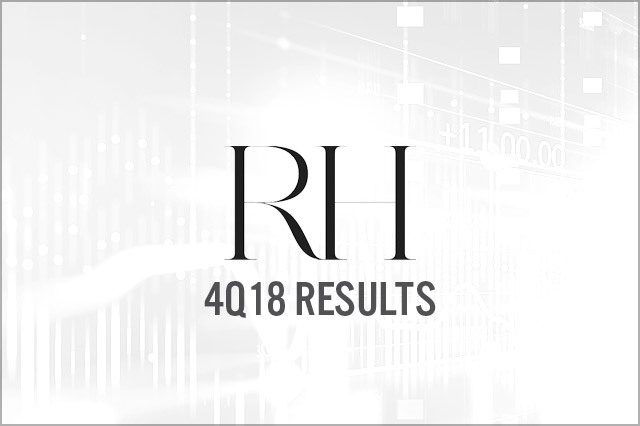 RH reported 4Q18 revenues of $670.89 million, flat year over year and missing the $686.4 million consensus estimate due to sales weakness in December which persisted through the remainder of Q4. Adjusted EPS was $3.00, beating the $2.86 consensus estimate. Comparable-brand revenue growth was 5%, beating the 4.8% estimate and the 2% reported in the year-ago quarter. The company reduced 2019 guidance due to weakness in its core business as well as in high-end housing, guiding for 2019 adjusted net revenues of $2.58-2.63 billion, an increase of 3-5%, and adjusted EPS of $8.41-9.08, an increase of 11-19%.